This series of lectures is given in memory of Professor Arthur Louis “Maj” Klein (1898-1983), a faculty member of GALCIT from 1929 until his death. In addition to his significant contributions as a teacher of aeronautical engineering, Klein was responsible for the engineering and building of the GALCIT 10-foot wind tunnel and made significant contributions to aircraft design. Mr. Kumar will articulate the Indian Space Program‘s vision of “Harnessing space technology for national development” and achieving self-reliance in building satellites, space transportation systems and associated ground segments. This vision has enabled India to develop operational applications of space systems in several areas including agriculture, fisheries, water resources, forestry, urban development, and disaster management. It has also fostered an operational constellation of satellites for communication & broadcasting, navigation and earth observation. The Indian Space Research Organization (ISRO) works in tandem with more than 60 Federal ministries and all Indian State governments to promote space technology tools and applications that provide stewardship and excellence in this vision of national development. 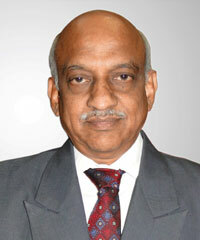 Alur Seelin Kiran Kumar is Chairman of the Indian Space Research Organization (ISRO), Secretary of the Indian Department of Space and Chairman of the Indian Space Commission. He obtained his Physics Honors and Masters in Science degrees from Bangalore University before obtaining his Master of Technology in Physical Engineering from the Indian Institute of Science Bangalore. Over the past four decades he has made extensive contributions to the Indian space program including more than 50 electro-optical imaging sensors flown onboard Indian satellites. These instruments have been the backbone of Indian remote sensing and meteorological satellites and have enabled the country to manifest an impressive array of applications. He has also made significant contributions to communications, navigation and microwave remote sensing payloads. He is a member of the International Academy of Astronautics and a fellow of many professional bodies including: Indian National Academy of Engineering, Indian National Academy of Sciences, Institution of Electronics and Telecommunication Engineers, Indian Society of System Engineers, Indian Society of Remote Sensing, and the Indian Meteorological Society. He is also a recipient of the distinguished Padma Shri Award (2014) for his contributions to the fields of Science and Technology. Created in 1961, the Centre National d’Études Spatiales (CNES) is responsible for proposing and implementing space policy in France. It is involved in all aspects of space (Launchers Ariane, Sciences, Observation, Telecommunications, Defense) through its four centers of excellence in Paris, Toulouse and French Guiana, with 2,450 employees and a budget of more than 2.3m (2017). As such, CNES plays a key role in the French, European and international space arena, driving initiatives, stimulating new proposals and providing technical expertise to support the design, development and operation of space systems. While some programs remain within national boundaries, many more would not see the light of day were it not for international partnerships. CNES represents France on the European Space Agency’s Council and is also a partner in several commercial enterprises, giving government support to strategic activities and maintains strong links with research organizations. Founded to implement France’s space policy and true to its vocation, CNES is constantly reinventing space. 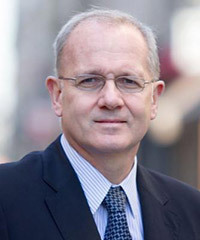 Jean-Yves Le Gall is President of the Centre National d’Etudes Spatiales (CNES), the French space agency, since 2013. In this capacity, he is Interministerial Coordinator for satellite navigation programs and Chair of the Administrative Board of the European GNSS Agency. He is also Co-Chair of the Council of the European Space Agency (ESA) and President of the International Astronautical Federation (IAF). Born in 1959, Jean-Yves Le Gall is a qualified engineer and scientist who has devoted his entire career to the European space program, holding positions within the French national scientific research agency CNRS, several French ministries, at Novespace and a first stint with CNES before joining Starsem and Arianespace for 12 years, where he was CEO then Chairman & CEO. He received the Astronautics Prize from the French Association of Aeronautics and Astronautics (AAAF) in 2001. He was named Via Satellite magazine’s 2005 Satellite Executive of the Year and received the Lifetime Achievement Award in 2007 from the Asia-Pacific Satellite Communications Council (APSCC). In 2011, he was inducted into the Hall of Fame of the Society of Satellite Professionals International (SPPI). In 2014, he received a Laureate Award from Aviation Week & Space Technology magazine. Jean-Yves Le Gall holds the rank of Officer in both the Legion of Honor and the National Order of Merit in France. He has also been awarded the Order of Friendship by the Russian Federation and the Order of the Rising Sun, Gold and Silver Star, by the government of Japan. The Indian Space Program was initiated in a small fishing hamlet near Thiruvananthapuram in the state of Kerala in the early 1960’s, not much later than the beginning of the global space era. There have always been questions as to why a developing country like India should spend money on space activity. This question has persisted through the decades. But the Indian Space vision is different from the rest of the world. Our first Prime Minister, Pandit Jawaharlal Nehru, stated “It is science alone that can solve the problems of hunger and poverty….. The future belongs to science and to those who make friends with science.” The guiding vision of the Indian Space Program articulated by Dr. Vikram Sarabhai confirms this sentiment in letter and spirit. In India, space-based applications focus on food and water security, weather and climate, environment and ecosystem, education and health care, skill development, rural communication, infrastructure development, disaster management support, smart governance and sustainable development. We have ensured and sustained constellations of satellites for Earth Observation, Communication and Meteorology. A satellite-based navigation system is being established. These space assets are essential in delivering the fruits of several application programs that have become the mainstay of the Indian Space Program. Also, the strategic values of space assets are being increasingly recognized. 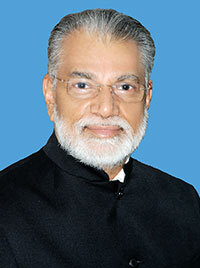 Dr. Koppillil Radhakrishnan is Chairman of the Space Commission; Secretary, Government of India Department of Space; and Chairman of the Indian Space Research Organization (ISRO). He drives the synergy of 16,000 strong "Team ISRO" and spearheads the country's Space Program. A graduate of Electrical Engineering from Kerala University (1970), and a Post Graduate in Management from Indian Institute of Management, Bangalore (1976), Dr. Radhakrishnan obtained his PhD from the Indian Institute of Technology, Kharagpur (2000). He is a Fellow of the Indian National Academy of Science, a Fellow of the Indian National Academy of Engineering, an Honorary Life Fellow of Institution of Engineers, India, and an Honorary Fellow of the Institution of Electronics & Telecommunications Engineers, India. Dr. Radhakrishnan has been awarded “Padma Bhushan,” the third highest Civilian Award in India in 2014 for his outstanding contribution to Science and Engineering in India. Dr. Radhakrishnan is the recipient of numerous accolades including the Allan D. Emil Memorial Award (2014) of the International Astronautical Federation, Distinguished Alumnus Award of IIT Kharagpur (2010), and IIM Bangalore (2010), the Vikram Sarabhai Memorial Award of Indian Science Congress (2010), and Social Sciences Award (2009) of the International Academy of Astronautics. After starting his career as an Avionics Engineer in ISRO’s Vikram Sarabhai Space Centre (VSSC) in 1971, Dr. Radhakrishnan has had a distinguished career of more than 42 years in space engineering, space applications and program management. Prior to assuming the role of Chairman, ISRO, he had been the Director of VSSC, the lead center of Launch Vehicle Development in ISRO. Earlier he had been Director for the National Remote Sensing Centre and founding Director of the Indian National Centre of Ocean Information Systems. In the last four years, Dr. Radhakrishnan has spearheaded "Team ISRO,” executing 29 space missions, an unprecedented accomplishment in its history. In this quest, India’s space capabilities for satellite navigation, strategic communications, microwave radar imaging and tropical climate studies have been established, in addition to ensuring continuity and capacity for operational space services. While the nine successful PSLV missions during 2010-2013 signify the ability to execute a wide range of satellite launch missions reliably, the concerted efforts towards a reliable GSLV with Indian Cryogenic Engine & Stage achieved a spectacular success on January 5, 2014. Under his effective leadership, India’s first planetary exploration -- the Mars Orbiter Mission -- was conceived, planned and executed with a great deal of originality. A clear programmatic direction to the year 2020 has been strategized to focus the country's needs and aspirations in all areas of the Indian Space Program. On August 5th 2012, Caltech’s Jet Propulsion Laboratory successfully landed the Curiosity rover on Mars. Curiosity is the largest rover ever sent to another planet. The landing system seemed wild to many observers, but it was in fact the result of carefully applied engineering reason and analysis. Entry, descent, and landing technology sometimes looks a bit foolish to the uninitiated. Dr. Steltzner will discuss four topics related to entry, descent, and landing: first, the history and development of the Curiosity EDL system and, in particular, the history of the Sky Crane landing system; second, differing touchdown systems, their architectures and techniques, including airbags, legged landers, pallets, sky cranes, and how they create understandable, predictable and testable systems; third, sensor technology and bandwidth and how the requirements for such bandwidth might vary across various solar system surface destinations; and finally, a brief treatment of entry technology, ballistic coefficients, inflatable heat shields and high altitude atmospheric variation will be offered. 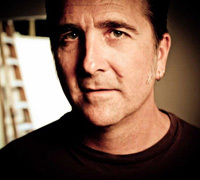 Dr. Adam D. Steltzner is the Manager of the Planetary Entry, Descent and Landing and the Small Body Access Office at the Jet Propulsion Laboratory. Most recently, he was the lead of the Curiosity Entry, Descent and Landing team. Adam received his B.S. in Mechanical Engineering from the University of California, Davis in 1990; he received his M.S. in Applied Mechanics from Caltech in 1991 and his Ph.D. in Engineering Physics from the University of Wisconsin, Madison in 1999. Adam joined JPL in 1991 and has worked on various projects that include Galileo, Cassini, Mars Pathfinder, Champollion, Comet Nucleus Sample Return, and Mars Exploration Rovers. His research interests include structural dynamics, input force determination, aerodynamic decelerators, mechanical design and systems engineering. His management interest focuses on how attitude and leadership can produce high performance teams.